Better cross guard on doppelsword. The rings on the doppel sword are very weak mine broke on the first day. 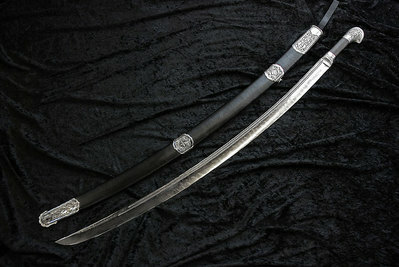 While the blade is sound you may wish to redesign the cross guard to come without them or to make them much stronger. The cavalry blade could already pass as a messer blade, all you need is a different hilt. There are no decent larp safe messers and with Calimacil being my go to for weapons I would hope they could fill that niche. I don't know why, but there are no LARP weapons I can find that based on the 1982 Arnold movie. If you were to make some (i.e. His father's sword, the Atlantian sword Conan uses, that cool looking double axe Rexor uses, etc), I think that would be just the bee's knees. And you know people are going to want to buy a Conan sword to smack their friends with! I was thinking that while you now have a colossal sword you could maybe make an even larger one. Maybe something akin to the sword from berserk. At the very least maybe you could make a blade as long as the colossal doppel sword but with a much wider straight blade. It would also look epic with the krieger wolf art style! Warn people before you take a product to the Crypt. Some of us dont have the money to get the products we want immediately,such as the now defunct Hangaku, the Jingu, the Kixstart Vibroblade etc. Some of us have to wait awhile, and during that while,products get discontinued. However,with some sort of warning, like a month or two in advance, some of us could focus our money into getting the product before it vanishes for good. What say you? Make a proper Saber blade. I would like to see a blade model with a proper saber curvature. Straight for about the first third of the blade and then actually curved like a historical saber. Not straight blades with a curve on the front edge like your current models. This would require a partially bent core, but those do exist so that should not prove such a problem. With such a blade you could easily create many different saber models and styles. Not to mention all the fantasy saber models that are out there. This would make me a happy and quite poor Swedish larper. Firstly, before anyone comments (This is already suggested). While it is suggested, Calimacil has stated that each suggestion should be made SEPARATE. So I'm restating this as it's own post, as the katzbalger is already in development. With the double hoops on both sides and the double crossguard and all. It's my favorite looking zweihander, personally. Though this particular blade is a ceremonial one. Either one would go really nicely along side the katzbalger. The xiphos is an iconic and visually appealing sword with a simple design and elegant leaf shaped blade. I've personally searched for a foam xiphos that would safely stand up to the rigours of combat , with no success. I'd love to see you expand your range of 'classical' weapons beyond the gladius and perseus, but the simplicity of the xiphos would make it appealing in fantasy as well as historical settings. I love to shop here, but it's so hard to know what fits and what doesn't because there are no measurements for the clothes. start listening to your customer-base...for real. the most suggestions made here are like 5 years old and you stated that you 'started' working on it - but nothing comes around. Sorry to say that, but It doesn't even feel like you looked into it. I mean, how is it possible to get nothing accomplished in several years regarding the top-rated suggestions? Instead you make this high-tech Laser-Swords for a little Star-Wars-Fan-Base, Butcher - Knifes or weapons that are based on videogames. WTF Calimacil? You sales would explode as soon as you would build what the community really needs instead of that crap. Please don't take me wrong. I love your products but I am pretty sure that you could do way better. I would like to see a war hammer made like game of thrones Robert Baratheons or Gendrys. Especially, if its made from calimacil! The products look so cool it would be nice to have a proper way to show them off. A mount for displaying weapons when they are not in use and a display rack for armour also would be awesome. 14th - Early 15th Century Weapons! I am a massive fan of historical weapons, as are others out there. I know of several LARPs out there with warbands or even individuals who base themselves off of Historical settings, particularly the 14th and Early 15th Centuries. Tapered arming swords, Historical style pole arms and Longswords, late medieval axes and hammers, Billhooks and even longbows would all be awesome. Please? make more versions of lord the rings based swords. make more lord of the rings based swords like striders sword, glamdring, and make shields and helmets based on lord of the rings too please and also I would like it if you made a second arenmegil sword I really liked that one so I would make these, a lot of people all over the world like it and lots of people posted the same thing so i'm not alone in this so please more. Making a scutum with horizontal grip is easier for legionaries to form testudo formation.